Contents and Media: 12 grey resin parts, a small PE fret, and a set of masks for the hubs. Beautiful delicate detail; alternatieve hubs and even a replacement nose gear fork are supplied. This set is a great improvement at a bargain price by today's standards. 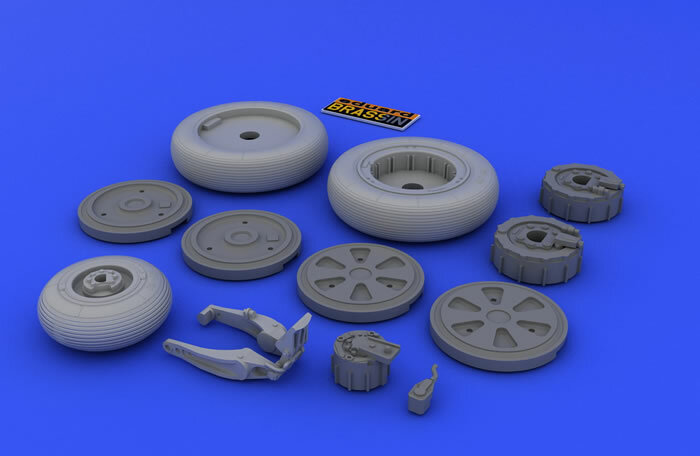 Following close on the heels of their blockbuster 1/48 MiG-21MF kit release, Eduard's Brassin MiG-21 wheel upgrade set is now available. The MiG-21 kit was designed completely using CAD technology, and while the detail molded into the small parts such as the landing gear and wheels is amazing, this new Brassin set uses the same technology to take things to the next level. Although not specifically stated, this set is applicable to any second or third generation MiG-21, from the MiG-21PF onward. The set is comprised of 12 flawlessly cast resin parts, a small PE fret, and a set of masks for the hubs. The level of detail in all of the resin pieces almost defies description. Tread detail is perfectly even, and the sidewalls of all three tires feature very subtly raised radial ribs as seen on the real article, as well as tire size information. One will want to paint carefully so as not to obliterate this amazing detail. 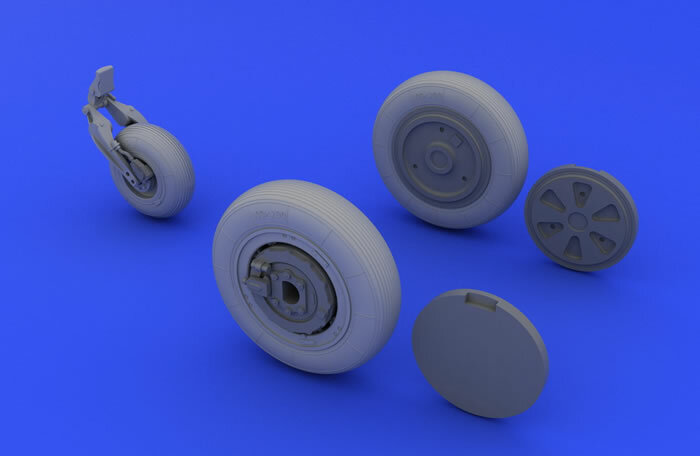 Each wheel's brake drum is a separate part, and the main wheels are (as is the kit itself) provided with alternate hubs for the "spoked" design seen on early aircraft and the later smooth design most commonly associated with the MiG-21bis. A replacement nose gear fork is provided that even has detail on the inside of the arms - surely a first! 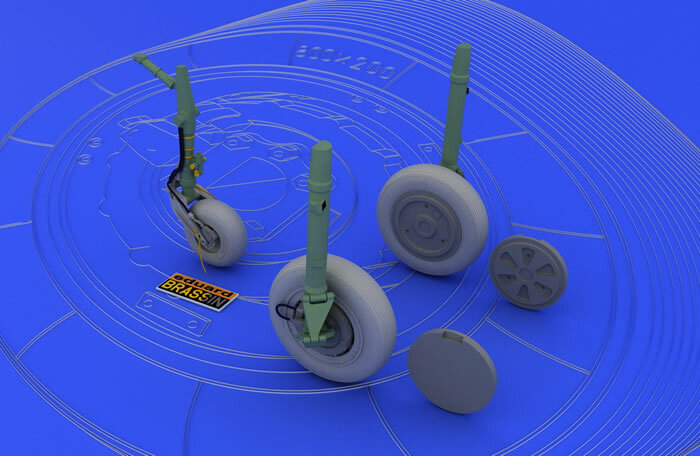 Photoetch is provided for several small details on the kit's nose gear leg, including clamps for the brake lines, and a portion of the brake line itself. The modeler is left to supply a small piece of wire (0.3 mm diameter) for the main brake line, and the instructions clearly show how this is to be attached. A full set of Eduard's yellow tape masks are provided, which should make painting these beautifully done wheels an absolute snap. I was initially somewhat skeptical that Eduard could do much to improve the wheels provided in their kit, but I'm happy to say I was wrong. This set is a great improvement at a bargain price by today's standards.